A healthy, make-ahead salad that’s low on guilt yet full on flavor, this Southwestern Corn, Kale and Quinoa Salad will become a new family favorite in no time. How, oh how is it August already?? This summer has just flown by but, hey, we still have at least a month left, so let’s make the most of it, shall we? 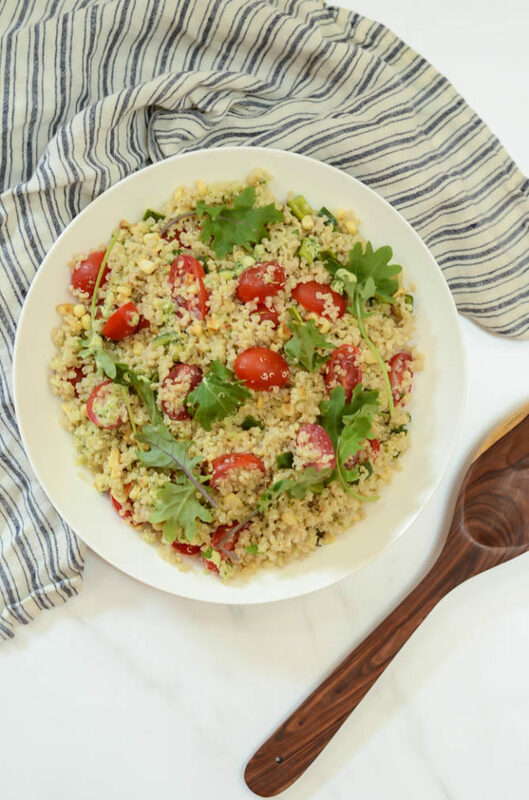 It may mean different things to different people, but I think one thing we can all agree making the most of summer does NOT mean is spending a ton of time in the kitchen – which is why you need some of this No Guilt Southwestern Corn, Kale and Quinoa Salad in your life. With the little one keeping me busy and the beautiful weather keeping us outside, I’ve personally found myself in the kitchen less than I have probably ever been in my life, which means I am loving anything that I can make a big batch of in advance. 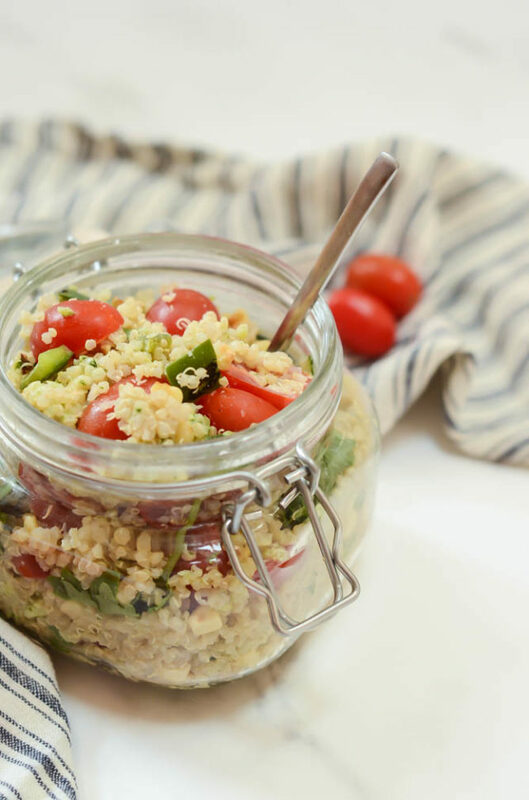 I need to be able to come home from a morning at the beach, reach into the refrigerator and have lunch there waiting for me – because goodness knows the little one will NOT wait for me to whip up any sort of elaborate meal! This Southwestern Corn, Kale and Quinoa Salad is just what my summer-loving heart ordered. Full disclosure, this recipe was inspired by a Trader Joe’s salad I grabbed in complete haste one day when I knew there was nothing waiting for me at home for lunch. Yes, it was a quinoa salad (which, on its own can be quite drab) but somehow the sweet corn, juicy tomatoes and creamy poblano-cilantro dressing all complemented each other just perfectly. So I set out to make my own version! 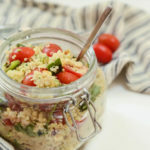 The salad part was pretty obvious – quinoa, corn, kale, tomatoes and some chunks of poblano pepper for good measure – but then came the dressing. I loved the creaminess of the dressing in the TJ’s version, but if this was going to be my go-to grab-and-go lunch, it needed to be as healthy as possible – which meant, Greek yogurt! I love how thick and creamy it is while also having so many nutritional benefits. And, honestly, I knew that all the other ingredients I’d be adding in were so packed with flavor that that was all I needed. Speaking of those other ingredients – garlic, cilantro and roasted poblanos, I’m looking at you! I knew that would be all I needed to make this No Guilt Southwestern Corn, Kale and Quinoa Salad of mine a reality. So, it’s pretty obvious that this recipe is packed with flavor, but the other thing I love so much about it is how much of it can be prepped in advance. Literally each of the steps that requires cooking can be done up to a few days ahead of time, so you can work on it whenever you have a free minute (or 10) in the kitchen. And, once it’s done and assembled, you’ll have enough Southwestern Corn, Kale and Quinoa Salad to last you at LEAST a week. If those aren’t all signs of a winning recipe, I don’t know what would be! Cook the quinoa according to package directions. (I usually put one part quinoa to two parts water in a saucepan, bring it to a boil, turn it down to a heavy simmer and let cook with the lid on for about 10 minutes, or until water is absorbed.) Fluff gently with a fork and let cool completely. Next, you’ll want to cook the peppers (both of them) and the corn. If you have a gas stove, simply cut the stem off of the peppers and hold them over a burner until they are lightly charred. If you have an electric stove, you may have to head to your grill to get that nice looking char. Let cool and then cut one pepper into large chunks and one into a small dice. For the corn, heat 1 tablespoon of butter in a medium saucepan over medium-high heat. Once the butter is melted, add the corn kernels and cook, stirring occasionally, until they are golden brown and smell caramelized. Remove from heat and let cool. The final thing you’ll want to prep before assembling the salad is the dressing. Combine all dressing ingredients (including the charred poblano that is in large chunks) in a blender, omitting the olive oil and salt for now. Blend until ingredients are fairly creamy, then start streaming in the olive oil, until you come to a consistency you like. Finally, season with salt. 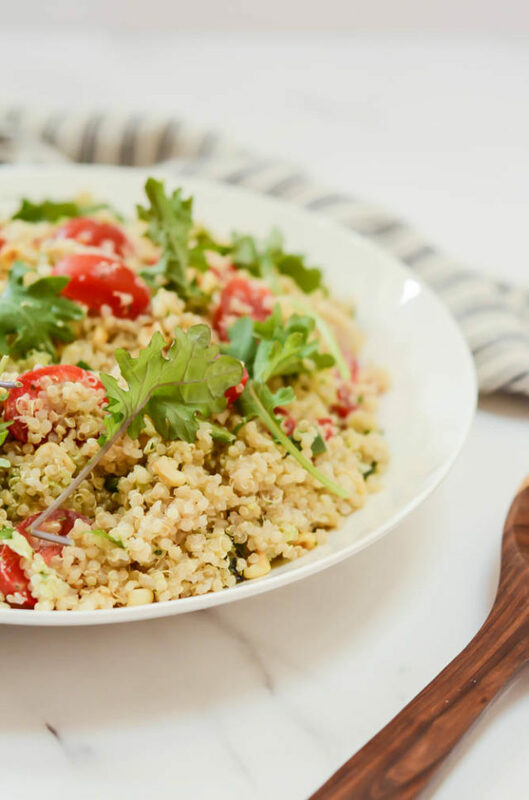 In a large bowl, combine all salad ingredients – quinoa, corn, diced poblano, kale and tomatoes – then pour on dressing and stir to combine. Salad will keep for up to a week in the refrigerator!